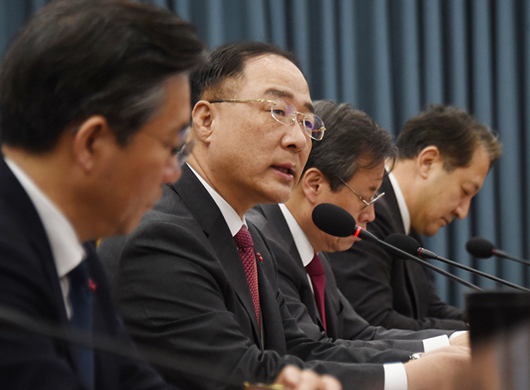 South Korea’s deputy prime minister for economy and finance minister Hong Nam-ki for the first time raised alarm about the pace of slowdown in exports that have so far sustained economic growth against sluggish domestic demand and vowed to come up with policy actions next month. “It is urgent to come up with measures to revive the sagging exports amid rising uncertainties caused by sluggish economic growth in the world and ongoing trade friction with the U.S. and China,” said Hong during a meeting on Wednesday. He also added that the government will announce its plan to boost exports by February. The Korea Customs Service announced last week that the nation’s exports in the first 20 days in January slipped 14.6 percent from the same period last year to $25.7 billion. If the trend continues, the country would end January with a losing streak for two straight months, marking the first drop for two months in a row since September and October 2016. But some said cyclical reasons have been driving the recent slowdown in exports rather than structural factors. “The weak exports have much to do with cyclical downturn rather than structural problems related to the local firms’ competitiveness,” said Minister of SMEs and Startups Hong Jong-hak, adding that some of the nation’s major research institutions expect the exports would improve in the latter half. The Korean government plans to provide 700 billion won ($626.8 million) worth vouchers to support research and development of the ICT sector for the next five years, with an aim to boost employment and exports. The finance ministry has set a goal to increase employment by 10 percent and exports by 20 percent in the ICT industry.